A little bit of background on the surgery....the goals of the kyphoplasty surgery are to stop the pain caused by a spinal fracture, to stabilize the bone, and to restore some of the lost vertebral body height due to the compression fracture. 1. During kyphoplasty surgery, a small incision is made in the back through which the doctor places a narrow tube. Using fluoroscopy to guide it to the correct position, the tube creates a path through the back into the fractured area through the pedicle of the involved vertebrae. 2. Using X-ray images, the doctor inserts a special balloon through the tube and into the vertebrae, then gently and carefully inflates it. As the balloon inflates, it elevates the fracture, returning the pieces to a more normal position. It also compacts the soft inner bone to create a cavity inside the vertebrae. 3. The balloon is removed and the doctor uses specially designed instruments under low pressure to fill the cavity with a cement-like material called polymethylmethacrylate (PMMA). After being injected, the pasty material hardens quickly, stabilizing the bone. So, they did one procedure last week that didn't seem to do much, and a second one was on Tuesday. The second placement of bone cement in Brandon's back seems to have gone well in that he was able to get up and walk the same day and has noticed a decrease in his pain. That is great news. Thanks for all the additional prayers said on and before Tuesday regarding his surgery. Down the road, they are hoping to be able to do 2 more vertebrae. Another great piece of news is that the doctors have said that Doan's genetic make-up is such that he should be able to respond really well to the chemo therapy he has yet to undergo. Brandon's particular type of treatment plan is the result of a lot of modern research in cancer drugs, and his team of doctors are on the cutting edge with developing it. We're so blessed that we have such a wonderful facility with world class doctors on the case right here in Salt Lake City. We are positive that all of the prayers from everyone have helped Brandon's and Katie's resolve to endure and press forward. We continue to be optimistic and appreciative of all the love and support we are receiving. Hey everyone! Progress continues to be made each day. We continue to feel very blessed and supported. It has been an emotional week with highs and lows as the reality of this situation continues to sink in. This week we really knew the chemo was working when Doan decided it was time to start sporting the shaved head look. His doctors were able to harvest more than enough stem cells for his transplant which will be in the weeks to come, and Brandon continues to work with the physical therapists to get up out of bed each day and walk around. He has been able to explore other areas of the hospital outside of his room and hallway, so that's nice that he can get a slight change of scenery every once in a while. It is yet to be determined how successful his surgery from last week went. (The one with the bone cement to hopefully alleviate some of the pain from the compression fractures.) However, he is going to have another one on Tuesday for another disc in his back, so we would appreciate an extra special prayer or two between now and then, and especially on Tuesday, that all will go well and that Brandon's pain will continue going down. They have taken him off of his IV pain medications and have gotten it under control using pills, so that's a big step in the right direction. Additionally, the doctors have opened up his diet so that he can eat a greater variety of foods from outside the hospital, and his appetite is getting stronger. We continue to appreciate all of your support and love knowing that there are so many people who care. We'd like to keep the calendar going with people fasting each day, so if you're able, please continue to sign up! It is a comfort and a strength to see your names and read your comments. Brandon has had a very productive day today. He started his stem cell harvesting ahead of schedule! His counts have risen and they were ready to start early this morning. The tech predicted that he would only collect 2 million out of the 20 million stem cells they need today, but instead, he ended up collecting 7.25 million! That blew everyone out of the water, but then again Doan always does! They are thinking that because his counts are continuing to rise they will finish collecting tomorrow morning. Tomorrow afternoon, after the collecting is done, Brandon is going to have a small cyphoplasty surgery. This is were they will make two small incisions in his back and insert bone cement into 2 of the most compressed vertebrae. They are hoping this will relieve his pain. However, as we have been well informed, it is not always a cure all. So, we would really appreciate some extra prayers that the doctors will be able to position the cement in the best places possible to alleviate as much pain as possible. With all of your hope and faith, not to mention Brandon's, we know that he will exceed the doctor's expectations! Birthday wishes come true! Brandon's blood work came back tonight and...the chemo is working!!! Doan's nurse said that the blood work they looked at today showed that the chemo worked really well and is successfully killing the cancer cells. The best part is that this was considered a "light" round of chemo in comparison to what's coming up, so hopefully that will knock out everything! Brandon is getting up out of bed a lot easier as the days go on and is walking more and more. (With the walker of course, but still.) His appetite continues to get better each day, and he has more interest in eating a greater variety of foods. We are all very encouraged by this news and recognize that Doan's progress is a direct result of all of your prayers and fasting. Please keep it up! We realize it is just as important now as it was before to call on the Lord and express our gratitude as well as ask for continued blessings to be with Brandon as he moves forward with his treatment plan. We can't thank you enough for all you have done and will be eternally grateful. There is a birthday on the horizon...Doan turns 27 on Sunday! While he would love to see you all on his birthday, visitors are not allowed at this time due to the stage of his treatment and the volatility of his immune system. However, if you would like to send your birthday wishes, feel free to call, text, or drop a card or whatever else at the Plewe home, the Crockett home, or the information desk at the hospital. Thanks for all your love and support! Hello all. I have kept putting off posting anything on this website because every time I go to do it I can't put into words the gratitude I feel for all of you. Words just don't express it. It has been so amazing to be put into a situation where we can witness, first hand, the power of people coming together to help and show their love. It has given me a new understanding of what people and their charitable hearts are really capable of. Thank you everyone. Thank you for your prayers, fasting, phone calls, texts, visits, food, running errands, notes, etc. I have heard from people I haven't seen or talked to in years who are lending their helping hand. There are so many people I've never even met who are leaving messages on Facebook or on this website of their support and encouragement. We could NOT be doing this without all of you. The fast list is incredible. Throughout the days whenever we hear good news about the treatment I thank Heavenly Father for the people who fasted for that day because I know we received that blessing because of their fast. I was just talking to Brandon tonight and he said Heavenly Father has no choice but to "open the windows of Heaven with his blessings," because of so many people who are praying and fasting for us. Brandon is doing really well. His first round of Chemo ended this last Monday and so far so good. He hasn't experienced any major side effects, just a little nausea here and there, but nothing that can't be fixed with a little Zofran. He has an incredible attitude. The first thing he said to me after we found out this was cancer was, "I know that we are going to be okay. I know without a doubt in my heart that we will make it through this." Ever since then whenever we hear about the road ahead or if he has to have a painful procedure he says, "Okay, I'll do what I need to do." I could not be doing as well as I am if it weren't for Brandon and his amazing attitude. Who would have thought it would be the patient who was helping the caregiver get through it? But, I know for all of you who know Brandon, that is exactly the person he is. He has a quiet strength that everyone trusts. I was talking to a family member yesterday about a quote she heard from a general authority that said in the pre-existence we chose our own trials that we would face here on Earth. Well, trust Brandon to choose one this big! He's always loved a challenge and has always exceeded any expectation. I have no doubt he will do the same with this. I know everyone is curious about what and when things are happening for treatment. As of now, we are waiting for Brandon's counts to drop and then rise so we can harvest his stem cells and then soon after that get a bone marrow transplant with his own bone marrow. After he's had his stem cells harvested and ready for transplant he will go through another, more intense, round of chemo and immediately after have his transplant. If all goes well a few months down the road he will have another round of chemo and a second transplant. When this is happening is all relative. We just have to wait and see how well he responds to this chemo and when the doctors think it best to proceed. We couldn't feel more blessed to live right here in Utah where the Huntsman Cancer Institute is just a half mile down from our house. Our doctors and nurses are all amazing, the best in the world. Thank you again for all your love and support. Please keep us in your prayers. We love you all. Well, Brandon is done with his first round of chemo. Three cheers for Doan...hip hip hooray! hip hip hooray! hip hip hooray! So far so good. Brandon has been really tired, but overall is handling the chemotherapy well. We're not exactly sure when we'll be able to know how well the treatment is working in terms of killing off the cancer cells, but the doctors are optimistic. Yesterday, Brandon felt well enough to check his email and got a haircut as well. He is looking dapper as ever and continues to put his best foot forward. We are so grateful for the capabilities of modern medicine and for all of you who are helping us through this. We will beat this one day at a time! There have been many people who have expressed an interest in helping to provide monetary donations to help Brandon & Katie Plewe. Any form of monetary donation can be made by visiting any Beehive Credit Union branch location (Account Number 513344) and donating to the "BP's Multiple Myeloma Fund" or via a PayPal donation by clicking below on the donate button (or on the permanent donate button link on the right side of your screen). Thank you so much everyone for all your prayers, thoughts, and donations. Every little bit of help is appreciated and is helping Brandon on his road to recovery. Happy Easter everyone! We certainly have a lot to be grateful for including the knowledge of a loving, living Savior whose infinite atonement teaches us so much about love and sacrifice. We so appreciate all of you who are displaying your love and willingness to sacrifice through your fasting, prayers, and comments. Every day, someone reads to Brandon the names of people who are fasting as well as any comments that have been posted. It truly gives him, and the rest of us, a boost to know that so many people are in his cheering section. Today is Day 3 of his chemo treatment. So far so good. He seems to be moving a little bit easier. With his back brace and a walker, he walked out into the hospital hallway and back today. (A little bit further than before!) The main effects of the chemo won't really be manifest for a few more days, but everyone is in good spirits and hopeful that the cancer cells are being killed off. He didn't need any additional oxygen today, so that means his lungs are nice and healthy. His body seems to be functioning more normally now than when he was admitted to the hospital just over a week ago. His coloring is looking good, and he continues to have a determination and drive to beat this. Once again, we cannot thank you enough for all the support we are receving at this time. We know that your petitions to the Lord are being heard as we recognize small miracles each day. Please continue to check in and sign up to fast and pray. We feel your strength and know that we are not alone in this journey. 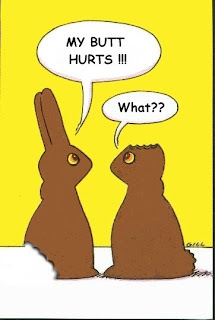 we thought everyone would appreciate this little comic on Easter! Brandon has begun his chemo therapy and is handling it rather well thus far! We love visitors, however, because his immune system will be so compromised, we need to be extra vigilant when it comes to his hospital visits. Please call either Katie or Bobbi to set up a time that would be good for Brandon, and we ask that it be no later than 9:00 p.m. While we all love children, so do germs...so please leave them at home. It is imperative that you are COMPLETELY healthy as well! Today, Brandon started his chemotherapy! Although it may be difficult, we're all happy that it is underway. The doctors say that once the chemo starts killing off the cancer cells, he should notice a decrease in the amount of back pain he is experiencing. Doan will be undergoing 24 hours of treatment for 4 days, and then the doctors will closely monitor his progress and how his body responds before the next phase of treatment begins. Additionally, once the cancer cells start being killed off, the fractures in his spine should be able to start healing. The physical therapist team will continue to work with Doan over the next several days to get him out of bed for a few minutes each day to keep his muscles working and to help improve his overall strength. We are also happy to report that his appetite continues to get better. Keep in mind, this is all relative considering a few days ago all he could handle was liquids and apple sauce! But, progress is progress. It seems that each new day brings new tests to run, medicines to try, and we learn new information. However, we feel confident that as we all continue to stay hopeful and pray to our Heavenly Father, we'll continue to see progress, especially now that his chemo treatment has begun. While your fasting and prayers are definitely still needed, they are certainly making a difference each and every day that goes by. We feel so blessed to have so much love and support from so many. "Our lives are not determined by what happens to us but by how we react to what happens, not by what life brings to us, but by the attitude we bring to life. A positive attitude causes a chain reaction of positive thoughts, events and outcomes. It is a catalyst, a spark that creates extraordinary results." We continue to be touched and uplifted by the outpouring of love and support from so many people. Brandon's appetite is starting to come back! He was able to eat a hamburger tonight...whoo-hoo! The physical therapists continue to work with him to build up his strength, and he is scheduled to start chemotherapy either tomorrow or Friday. We know that as we all continue to combine our faith through fasting and prayer, we'll continue to see progress and eventually beat this! - He was able to get out of bed again, and walked (with help) around the room. - They took more bone marrow for further testing, and he was a trooper! They expect to start chemo by the end of this week. - Elder Clayton, a general authority for The Church of Jesus Christ of Latter-Day Saints, visited the hospital this evening and gave both Brandon and Katie blessings of strength and comfort. We all continue to feel the hand of the Lord in this difficult time. With only a few days in operation, BrandonPlewe.com has brought about a massive outcry of love and support for Brandon, Katie, and their families during this time of need. More than 100 people have already signed up to fast and pray and there have been over 1,700 site visits since Saturday when the website was created. THANK YOU so much to everyone for all the love and support. It is so amazing how the Lord has blessed our generation with these great tools of technology to help "circle the wagons," combine our faith, and communicate our love and prayers with one another. Please continue to share this website with others and encourage them to sign up for a time to fast and pray. Every thought & prayer helps to pull strength down from the heavens! Monday was a good day for Doan! He was able to sit up in bed, and with the help of a walker and the physical therapists, he walked from one side of the room to the other! His kidneys continue to improve and his skin is looking great as well. All of your prayers are being heard and appreciated! Keep it up! Please CLICK HERE to sign up for a day to fast. THANK YOU! He loves to see friends and family, so you are welcome to come for a short visit to say hello. However, due to increased risk of infection because of his compromised immune system, please do not bring children and make sure you are in good health as well! Additionally, Brandon is unable to eat food from outside of the hospital, and his room cannot have flowers or balloons. The love and support that has been poured out on Brandon, Katie, and their families is much appreciated. We appreciate your continued prayers as we tackle this disease! There will be a donation account set up at Zions Bank to help with the costs of Brandon’s treatment. Your donations are greatly appreciated! We all have felt the hand of the Lord throughout this whole process and have a lot to be grateful for. An optimistic attitude goes a long way, and both Brandon and Katie continue to exemplify attitudes of love, hope, and courage. If anyone can get through this, it’s our Doan! He has strength and grit beyond what any of us even realized before. As President Thomas S. Monson said “The future is as bright as your faith." Since the beginning of January, Brandon was having back pain and went to several doctors to get treatment. Back problems are common in Brandon’s family, so everyone treated it accordingly without questioning other causes. Initially, they thought it was Faset Joint Disease, so he was treated with cortisone shots. When that wasn’t working, another doctor diagnosed him with Degenerative Disc Disease and gave him epidural shots. After several weeks, the epidural shots weren’t having much of an affect either, so they were then referred to an internist. A couple days later, Brandon went to see the internal medicine doctor and was immediately encouraged to go to the emergency room where they could admit him to the hospital. So, they did just that. After several tests, scans, and a bone marrow biopsy, Brandon was properly diagnosed on Friday night. With the knowledge of his diagnosis, it was determined that the Huntsman Cancer Center would be the best place for him to receive treatment. Saturday morning, Brandon was transferred to the University of Utah Hospital Bone Marrow Transplant Unit which is an extension of the Huntsman Cancer Center since their new BMT unit is not yet ready for in-patient treatment. The team of doctors that is working with Brandon and his family are absolutely wonderful. At the Huntsman Cancer Center, there is a team of doctors that specialize in Brandon’s specific type of cancer. People come from all over the world to get treatment from Dr. Tricot, so we all feel very fortunate and blessed to have this facility and these individuals right here in Salt Lake. Multiple Myeloma is a form of cancer that is usually seen in African American males age 60 and over. Obviously, Brandon is an extremely atypical case! The essential features of this disease are: its appearance in the marrow as malignant plasma cells; its involvement in multiple sites in marrow; its destruction of bone; and its association with abnormal proteins in the urine and in the blood. Basically, plasma cells are present in abnormally large number in patients with myeloma. The cells accumulate in an uncontrolled manner and form tumors in the marrow. In consequence, the abnormal plasma cells also create large amounts of a single type of protein (monoclonal immunoglobulin or M Protein) which is then secreted into the blood. Normally, plasma cells create several types of proteins which are antibodies that protect the body. By contrast, the production of M protein does not protect the body against infection while at the same time, those healthy proteins aren’t being produced. Another special feature of myeloma cells is that they secrete chemicals that stimulate other cells that dissolve bone. Although bone is constantly being broken down and remodeled, the chemicals that are secreted cause the breakdown to happen faster than the remodeling. Thus, the bone is thinned and can be weakened enough to break with normal stresses such as walking or lifting. Slightly increased stresses of coughing and minor falls or injuries can also break the bones when they are thinned by the effects of myeloma. Bone pain is the most common early symptom of myeloma. Most patients feel pain in their back or ribs, but it can occur in any bone. The pain is usually made worse by movement, so we can only imagine the pain Brandon has endured as he has been working and going to school full-time throughout the past few months. When Brandon was transferred to the Huntsman Cancer Center, the main goal was to get his pain under control, to get his kidneys properly functioning (they were clogged from excess calcium in the blood from the breakdown of the bones), and get his CBC (complete blood count) more normal. Everything is looking really positive so far. Brandon has already started taking various steroids to slow down the production of the malignant cells, and as of now, chemo therapy will begin as soon as Monday or Tuesday of this week. Brandon will be going through various rounds of chemo therapy after which he will have a bone marrow transplant. Initially, they will try to use his own bone marrow for the transplant in hopes that his body will take over with healthy cell production and go into complete remission!